The United States Congress designated the Lostwood Wilderness (map) in 1975 and it now has a total of 5,577 acres. All of this wilderness is located in North Dakota and is managed by the Fish and Wildlife Service. Approximately 10,000 years ago as the glaciers receded from North Dakota a ridge of rock and soil was deposited along what is now the Missouri River. As the ice melted from within this formation of rock and soil, a landscape of rolling hills and wetlands developed known as the Missouri Coteau. The Lostwood Wilderness is located in the Missouri Coteau and is dominated by northern mixed grass prairie. Over 100 species of grasses can be found in this area and numerous species of wildflowers brighten the landscape from April through August. 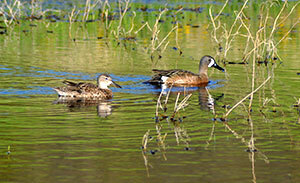 Lostwood Wilderness is home to an abundance of breeding waterfowl as well as many species of grassland dependent songbirds including, Baird’s, La Conte’s, grasshopper, and savannah sparrows, and Sprague’s pipit. The climate of this area is typical of the Northern Great Plains, with annual precipitation ranging from 12-17 inches. Typically the months of May and June receive the most moisture with the remaining summer months hot and dry. It is not uncommon to exceed temperatures of 100 degrees Fahrenheit during the summer months and 20-30 degrees below zero during the winter. With few natural land barriers the wind moves freely across the Plains with speeds often 5-20mph and 25-35mph. The highest point in the Wilderness is 2,470 feet. The Lostwood Wilderness, as well as the Refuge in which it is situated, protects some of the best native prairie in North Dakota. The Lostwood Wilderness lies in the northern section of the Refuge and is open year-round to hiking, photography, bird-watching, snowshoeing, and cross-country skiing. Planning to Visit the Lostwood Wilderness? How to follow the seven standard Leave No Trace principles differs in different parts of the country (desert vs. Rocky Mountains). Click on any of the principles listed below to learn more about how they apply in the Lostwood Wilderness.